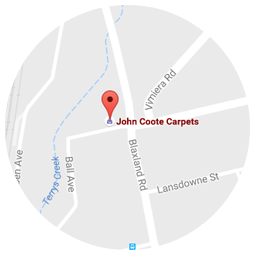 John Coote Carpets was established in the mid 1900's in Eastwood and is recognised as one of Sydney's most successful independent flooring retailers. Our wholesale carpet warehouse and a second retail showroom is located in Auburn. We have supplied and installed flooring products carpets, timbers, vinyls and rugs for generations of families. The key to our longevity as a business is our ability to deliver top quality service and product at the right price to meet our clients' needs. Word of mouth is our best form of advertising! "I am writing to compliment your installer who laid our floor recently in Eastwood. He was extremely professional, the result is excellent and we would like you to pass this on and thank him for his diligence and the professional workmanship that was carried out" Karndean vinyl planks installed. "The office staff and carpet layers from John Coote Carpets were professional, helpful, prompt and efficient. They did a fantastic job with laying the carpet, the carpet was of high quality while being reasonably priced and they did the job quickly and within the time frame I wanted. I would recommend this company to anyone looking for a great carpet company". "Great family business, prompt and attentive, delivered a quality product and on time. A pleasure to deal with". "Your price was competitive, the staff were on time, friendly and helpful". "I did go with John Coote Carpets not only for the carpet installation but for the carpet as well. I'm so pleased with the job. Their pricing was the best one I got for the type of carpet I wanted. The installation happened without any glitches. Both the measurer and installers came at the date/time they said they would and I was satisfied with the finished product. And best of all, they managed to do it in such short notice. Very happy to recommend".